Cotton Candy is a fun toddler hat that is easy to knit, finished off with a big beautiful bloom. Getting ready to begin your great Cotton Candy Toddler Hat. What is the gauge for this? I see you call for worsted weight yarn and also would like to know if DK weight would work? Thanks. Hi Suzanne! The gauge is 24 stitches and 17 rows = 4 inches. Thanks for your interest in the Cotton Candy Hat! Happy knitting and please let me know if you have any additional questions! When you are using a circular needle, then knit each round comes out as stocking stitch. You just need to ensure that you use a marker before the 1st stitch that you carry forward at the beginning of each round otherwise it's easy to lose the beginning of each round. Good luck with the hat, a circular needle will produce a much neater finish. Thanks for sharing! I have knitted two of these now and they come out so cute! You are so welcome! I love to share and am so glad you have enjoyed the pattern! This hat is so adorable! But, I am wondering if you could give instructions for a 6 year old girl? I've made the hat for "Dolly" and would love to see my twin grandaughters wearing the hat along with their dolls. @ Karen You are so welcome! It warms my heart to know the little ones are so cared for! how do I print out your patterns? can't find a print icon. I love your cotton candy hat! Would love to use the same yarn that you did for model pattern-can you share that with us? Has anyone adapted this for a woman's size; chemo hat? I love the flower & perfect for a sassy chemo head. Could you please program it to print out only the pattern? Sorry, I'm unable to do that but if you want to just print the pattern text from this site, you can always highlight the text you need, then right click with your mouse and select copy, then paste to a word document. Doing it that way allows you to save it too if you need to. Hope that helps! How cute! I plan on knitting this for my granddaughter for next winter. She will be 5 years old and usually has a pony tail. If I increase the size of the needles will I be able to knit it to fit her? I love the flower! Increasing the needle size would definitely make it bigger...also you could cast on more stitches...just do it in increases of 4 so that the decrease works out. Also, the hat is very stretchy, I know of a four year old who wears this hat still. 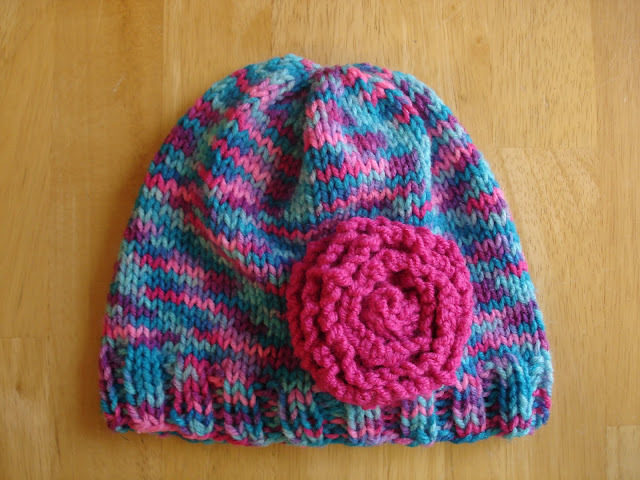 I DON'T KNOW HOW TO USE CIRCLE NEEDLES TO CONTUE A ROUND CAN U HELP I WANT TO MAKE A HAT ? Love this!! And so does my daughter! Could you please give me instructions for a little larger--my daughter is 5. Sure! I'd have to knit one up to get an exact number, but you could always go up a needle size or two, or cast more on a few more stitches...just do it in increases of 4 so that the decrease works out. Also, the hat is very stretchy, I know of a four year old who wears this hat (as made according to the pattern above) still and it fits nicely. This is so pretty, and it is insisting I stop resisting the 'circular' needle...but I too would like to know the size for a child around 6 years old...please? Sure, I left a response for the person above with a similar question...I'll have to make one up in a bigger size and update the pattern! Fun! beautiful hats, m going to try it. but for the flower or bloom, can you tell me if BO means bind off, and if KFB means to knit the front and back of each stitch. thanks for your help jut wasn't sure on these two abbreviations. Any tips for sewing the bloom onto the hat? Can I download this pattern as a PDF file? Hi you should be able to - there's a neat way and a quick way.. The neat way is to highlight from the pattern title down to below the Copyright notice wording. Right click your mouse and choose copy. Open a blank Word document and right click your mouse and choose paste. You now have the pattern. Click 'save as' and choose PDF from the list - name the file and choose where you want to save it. The easy way is to Click the 'print friendly' icon at the bottom of the pattern. The 2nd line of the box that appears is 'destination' and should show the name of your printer. Click 'change' and choose 'save as PDF. You will need to type '1, 2' in the 'pages box, otherwise you will end up with all of the comments as well. You will be able to change the filename and choose the save destination. Hope that helps. I am a beginning knitter and would like to make this adorable hat for an infant - 3 months old. What's the best way to downsize this pattern? Knit fewer rows? Use a smaller gauge needle? Both? Thanks in advance. How would i adjust this pattern to knit for my 8 year old daughter?